Virginia's college graduation rate is an indicator of the quality of the state's K-12 and higher education resources. High graduation rates reflect efficiency in the educational system, and benefit Virginia by contributing to the quality of the workforce. In addition, the percent of high school seniors planning to attend a two- or four-year college is an indicator of K-12 student preparation, family influence, academic counseling and the availability and affordability of post-secondary education in the state. College graduation rate is one measure of the success of our post secondary education system. Of the degree-seeking students who enter Virginia's higher education system, the rate of degree completion indicates how many graduate within a reasonable amount of time. The post-graduation plans of high school seniors provide an indication of the perceived opportunities available in higher education and preparation to take advantage of those opportunities. Measuring college graduation rates as the proportion of degree seeking students who finish their degree within six years for a bachelor's degree and three years for an associate's degree, Virginia's graduation rate for Associate's level students has fluctuated around 22 percent, although there was a recent rise to 27 percent in 2004. This rate was below the national average of 30 percent, placing Virginia at only the 30th-highest rate in the nation. This rate is above North Carolina's 19 percent and Maryland's 12 percent, but below Tennessee's 29 percent. The highest associate degree graduation for the nation in 2004 was 65 percent in South Dakota. 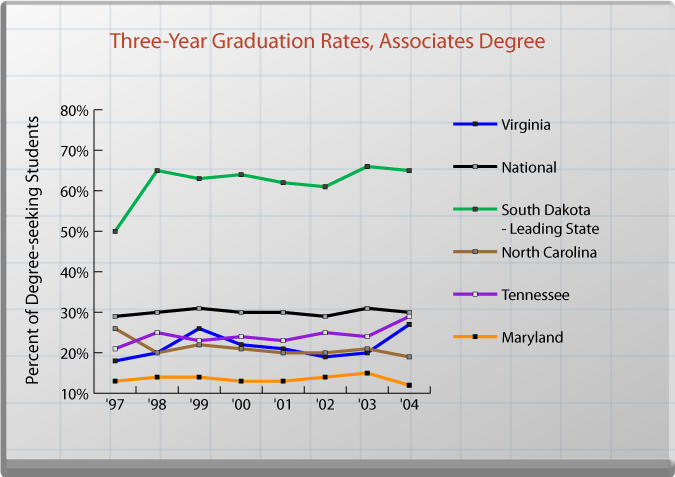 In contrast, Virginia's rate of graduation for bachelor's degrees is the 10th-highest in the nation. After a five-year rise in the Baccalaureate level graduation rate, the rate has leveled off at approximately 62 percent. The highest ranking state, Massachusetts, had a rate of 67 percent. North Carolina, Tennessee and Maryland had rates of 58 percent, 49 percent and 64 percent respectively. 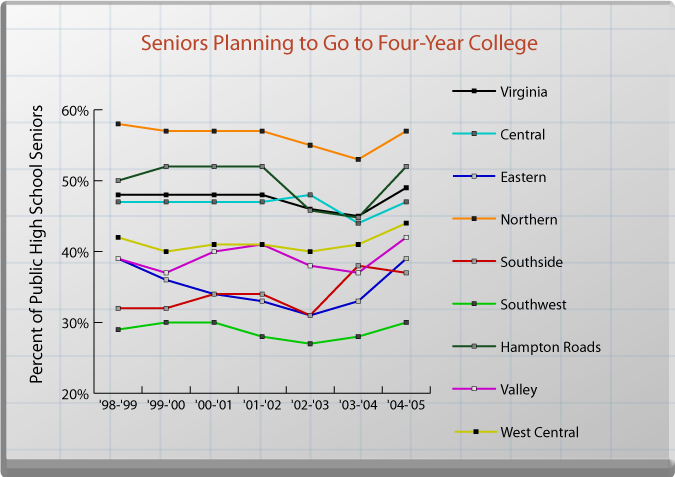 In terms of high school seniors' plans, nearly half of Virginia's graduating seniors who were surveyed planned to attend a four-year college. Over half the graduating high school seniors in Northern and Hampton Roads regions plan to attend four-year colleges, at 57 and 52 percent respectively. Southwest and Southside regions had the largest percentage, 37 percent each, of students planning to attend a two-year college program after graduation. What Influences College Graduation Rates? College graduation rates are primarily influenced by three sets of factors: how well students are prepared for college, affordability and access to financial aid, and institution efforts at retention. Statewide graduation rates recognize that many students change institutions before they graduate. Therefore, graduation rates should not be used as a measure for individual institution success. High school seniors' plans to attend college are influenced by a variety of factors, including the availability of opportunities in the region and in the state, preparation in high school, guidance and career counseling, and the financial cost of the education. The state's primary role with regard to college graduation rates is in assuring that Virginia's high school graduates have the knowledge, skills and resources they need to successfully complete post secondary education. This includes ensuring that high school standards are rigorous and aligned with college expectations; ensuring that low-income students have access to financial aid; and providing a coordinated system of higher education with adequate resources and infrastructure to meet the demands that are placed on it. In addition, the state can affect college graduation rates by ensuring that Virginia's system of higher education remains a diverse mix of public and private institutions, providing a broad range of options available to Virginia students. Four-year college plans - student plans to attend a four-year accredited college or university. Two-year college plans - student plans to attend a two-year or community college. Other plans - student plans to attend a business school or trade/technical school, or participate in an apprenticeship program. No continuing education plans - student provides no further education plans upon graduation. Military - student plans to serve in the Military. Employment - student plans to go into the workforce. State-Level Data: National Center for Educational Statistics. IPEDS Graduation Rate Survey, Washington, D.C.: U.S. Department of Education. Percentage of first-time full-time degree-seeking students. The calculation does not account for transfers across institutions. P-16 Council:The P-16 Council works to coordinate initiative and reform efforts across the spectrum of K-12 education in Virginia. Commonwealth Scholars: This pilot program encourages students in 11 participating school divisions to take rigorous courses that go beyond the minimum graduation requirements for a Standard Diploma. Early College Scholars: This program allows eligible high school seniors to complete their high school diploma while earning at least 15 hours of transferable credits toward a college degree, resulting in a more productive senior year and reducing the expense of college tuition for families. Students earn these credits through dual-enrollment programs and by taking Advanced Placement courses at their home high schools or through the Virginia Virtual Advanced Placement School. Commonwealth College Course Collaborative: The CCCC is a common set of subjects that allow Virginia students the chance to earn a semester's worth of college credit while in high school. Articulation and transfer agreements: The Virginia Community College System and four-year colleges in Virginia have developed systemwide articulation and transfer agreements governing the granting of credit for specified courses at community colleges and providing for transfer to four-year institutions for community college graduates meeting certain criteria.